The SAFE Systems PD 2100-D is a skid mounted, heavy duty, high performance vacuum system which is designed for vacuum recovery of abrasives and dust generated in the abrasive blasting process. Fork lift pockets and lifting eyes give the contractor options for easy handling and placement at the jobsite. A large capacity fuel tank eliminates the need for frequent job interruptions to refuel. Driven by a 100 HP diesel engine, the system utilizes a Roots positive displacement (PD) vacuum pump. The noise levels of both the vacuum pump and diesel engine are reduced by large silencers. The vacuum can produce up to 27" Hg (vacuum) and will recover abrasive through long distances of properly attached and configured 4" diameter vacuum hose. This vacuum is designed to be used in conjunction with a collection device such as our 200 CF collection tank (CT-200) Auto-Dump (AD9) or one of our blast and recovery systems, MSH 4-24-2, MSV 6-40-2 or MSV 2-15-2. Vacuum recovery rates will vary depending on the material being recovered as well as the length, size and position of the recovery hose. Vacuum dust collector rises to working position to allow access for 55-gallon drum. Certified lifting eyes for handling with overhead crane. Diesel driven by a 100 HP John Deere engine with a PTO clutch. Direct drive from diesel PTO clutch to vacuum pump. Vacuum pump capable of 27” HG. Four (4) VDC filters in the vacuum dust collector. Automatic reverse pulse cleaning system for VDC filters. One (1) safety filter to protect vacuum pump in case of filter failure in vacuum dust collector. ¾” air supply required for pulse cleaning system. 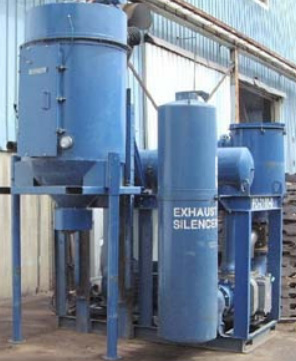 Exhaust silencer and bleed air silencer to reduce equipment noise. Abrasive should not be vacuumed directly into the vacuum dust collector. Equipment is designed to be used in conjunction with a vacuum collection tank/hopper. Not designed to vacuum wet materials. Vacuum dust collector should be emptied every 2 hours. The butterfly valve on the dust discharge of the vacuum dust collector must be completely closed during vacuum operations to avoid damage to the valve and/or the dust collector cone.